i’ve been working on some new necklace designs, as i got some proper crochet thread and don’t have to use embroidery floss any longer. i’ve named this one ‘victoria drop’, and it’s listed in my etsy shop if you’re interested in purchasing it. i’m pretty happy with the way it came out. i added a ribbon to the top of this instead of another kind of closure to make it more adjustable. also, a question. i have recently been stumbling across this link, which is now officially haunting me. does anyone know anything about this? what could they possibly teach you? i’m so intrigued, and so very wary at the same time. also, a review. i just got the first copy of adorn magazine, and i want to make nearly everything i saw. i loved the projects- everything is relatively inexpensive, and there are projects for many different types of crafting. something for everyone. the only thing i’m not a great big fan of is the way they address us as the audience of “crafty girls”. i mean, i guess we’re all girls still, and always will be (? ), but why exclude men? or, crafty boys? i was surprised, too, because these types of things don’t usually bother me. anyway, go get it- it’s well worth the cover price, and i hope to get a subscription from the magazine subscription fairy. This entry was posted on July 17, 2006 at 1:38 pm and is filed under musings. You can follow any responses to this entry through the RSS 2.0 feed. Both comments and pings are currently closed. It’s beautiful! And I love the feel of beaded thread; your other necklace had such a beautiful weight to it. I agree re: “girls.” And am very interested in this magazine. you’re totally rocking the crochet necklace action! good for you! the ribbon closure is great. I read about also making a loop on one side, nice button on the other. duh to me! This is beautiful — I want one! american crafts institute looks fishy to me. i wish that it were true….i would be a millionaire for sure. 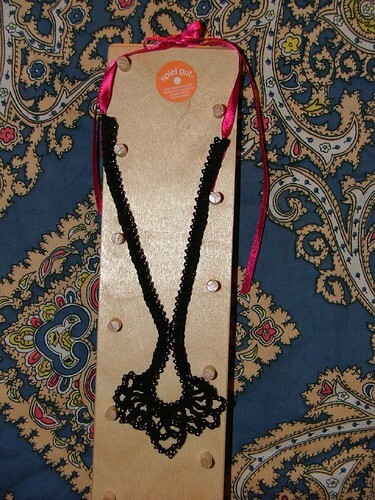 if you’re up for a craft circle, i am too……your crochet necklaces look like fun to make. i can crochet but not too well.